Once a week for over a year now, Chris and I get together with two other couples to watch TV. It all started when Lost was in its final season. We attended a party where a bunch of our friends had gathered for the premiere. As the season progressed, attendance quickly tapered off until there were just six of us. During that season, we found a rhythm. Our weekly parties became a sort of potluck. Whoever was hosting was responsible for the main dish and the other two couples (okay, let’s be honest here, the other two ladies) would bring an appetizer and a dessert. We all began looking forward to “Lost Night,” and, when the show finally came to its unsatisfying end, we decided we wanted to keep things going. New shows were auditioned and we chose Breaking Bad, which has been phenomenal, heart pounding, and yell-at-the-screen-worthy. It’s still called “Lost Night,” though. “Breaking Bad Night” doesn’t quite have the same ring. Being that this weekly gathering is a dinner party of sorts, our friends have faced some challenges with the gluten-free thing. They’ve taken them on beautifully and without complaint—something that I appreciate to no end. My challenges, however, lie elsewhere. The difficult thing for me about rotating responsibilities for a potluck: I have a really hard time coming up with appetizers. Main dishes? I do that every night anyway. Dessert? Please, asking me to bake something is like asking a five-year-old if they want to go to Disney World. But appetizers? I get, well…lost. The thing is, I really want to be that person who is able to put together platters full of beautiful little nibbles. I want to be able to set out casual yet smart, snackable spreads. When I get to thinking about it, though, my mind starts somersaulting over ideas—it never seems enough until all of a sudden it’s too much, and then I can’t think at all. So it’s been a good exercise for me to, every couple weeks, bring an app to the table. And in my efforts to create noshes that aren’t boring or too fussy or difficult to transport, I’ve found a quick and fabulous new go-to. Never underestimate a good bean dip. It’s one of the fastest things you can throw together and, when done well, can be a real crowd-pleaser. All you have to do is toss cooked or canned beans into a food processor with a few other flavor components and set some tortilla chips or crackers alongside. Done. 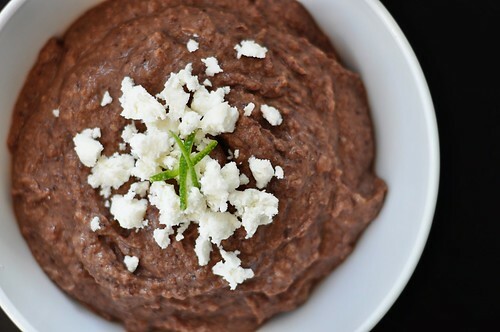 This Black Bean Dip contains only five ingredients. It’s not a revolutionary presentation by any means, but the flavors are solid and I will gladly make it again. Be sure to pick a salsa you really enjoy—I used some that I canned over the summer—and then process it to your liking. 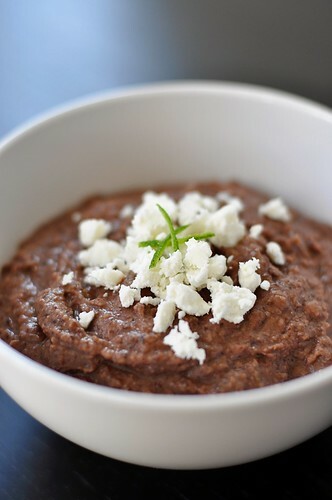 I let mine get pretty smooth (it was described as being almost like a “black bean mousse”), but a few quick pulses will leave you with a chunkier dip. It’s really amazing how relationships grow when you do something as simple as make a commitment to get together on a regular basis. It also helps you to realize how quickly things change. Over the past year, our little group has seen a pregnancy, a wedding, an engagement, and (as a result of said pregnancy) has grown by one. We’ve already experienced so many milestones together. Perhaps my becoming appetizer-proficient will be one more. Place the beans, salsa, 1 oz of the cheese, the cumin, and lime juice into the bowl of a food processor. Pulse a few times to combine. For a chunky dip, pulse a few more times or until the desired texture is reached; for a smooth dip, process for a minute or two, until the consistency appears even. Taste and adjust for salt, if needed. 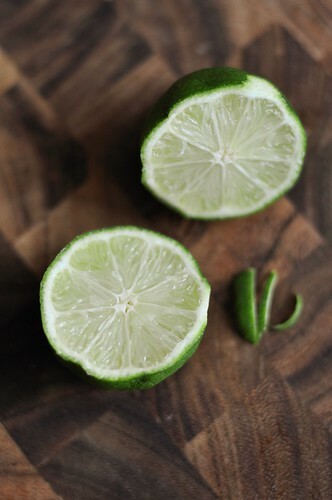 Transfer the dip to a bowl and garnish with the remaining ½ ounce of cheese and, optionally, a bit of zest from the lime. Serve with tortilla chips. *If your market doesn’t have cotija, you could also use chevre, feta, manouri, or ricotta salata. Depending on what you use, the final texture and flavor of your dip will vary slightly, but these would all produce great results. The Bean dip looks and sounds great. Heard you have new glass for your Nikon!…what lens type is it? How do you like it? Thanks!Yes, I picked up a 50mm 1.4 and I'm loving it. It's amazing what a difference a lens can make. Oh wow, great idea mixing the black beans with salsa for a dip! I need to try this. This looks great…I love the fact that it's a good source of vegan protein! Yummy! This looks beautiful and simple! Thanks for sharing.